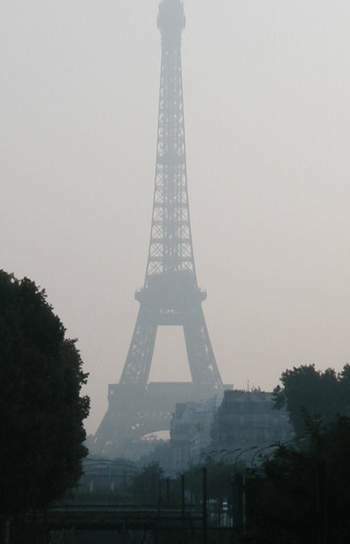 Air pollution is terrible with this heat wave. Bad ozone is created when there is too much heat, sunlight, and car/truck exhaust. So, instead of the blue skies I've shown you earlier this summer, this is now what the sky looks like on a clear, sunny day. These pics were taken at about 8a.m. as I went on my morning walk. The flying object, above, is a seagull. We both have been very busy with Tom's big new textbook, The Norton Album. We're under deadline pressure. There has been no time for the journal. And it is too hot to carry a camera. 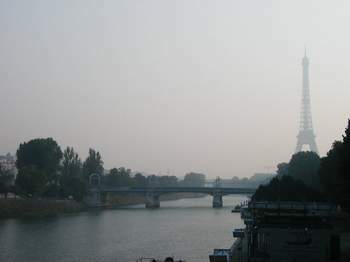 With the air pollution, the pictures aren't so pretty anyway. The heat wave goes on and on. It was 100 degrees F yesterday evening at 7p.m. Some days, it reaches 102. In the back of my mind, I realized that this might cause some concern among friends or family -- the combination of no journal entries and an incredibly bad heat wave. Then I decided to wait and see who would be the first to notice and inquire about our well being. First Prize goes to Steve S., a long-time friend of mine and my first web site client. (See www.osu.edu/CampusPartners.) He sent a message expressing concern day before yesterday. He is a thoughtful and caring person. The next inquiry came from Charles W., one of Tom's former colleagues, but he only asked why no more journal entries. He mentioned the heat wave, but did not express concern about our well being. So, my mom and dad got the Second Prize. They sent a message yesterday, saying they were very concerned. We are holed up in the apartment working all day. Well, actually, I get up earlier than Tom and I go out for an hour-long walk at 8 in the morning, when it is only in the 80s. I buy the day's newspapers on my way home. 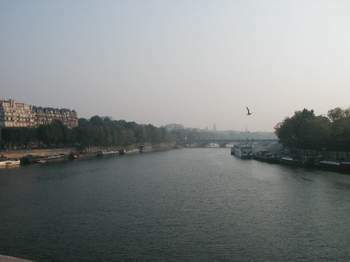 I walk along the Allee aux Cygnes, on the Seine, and there are plenty of other walkers and joggers out there at that time of day. When I get back, I close up the apartment to try to keep the "cooler" air inside. The southern exposure is wicked. Today, I added a layer of sheet over the sheer curtains in the living room and dining room to keep more sun out. All day we work with computers and fans going. I work in a bikini bottom and a tank top. Periodically, I go to the bathroom sink and wet the tank top, putting it back on soaking wet. Then I sit back down at the desk and work more, the fan blowing on my wet shirt. Lunch is just a gourmet salad that I make in the kitchen. No cooking. We drink LOTS of water. At 8, we go out to eat. We are finding a few air conditioned restaurants. Our very favorite place, Le Tire Bouchon, closes tomorrow for a few weeks of vacation. It is air conditioned perfectly. We went the other night, and they gave us a long, warm farewell when we left. The owners of that place are becoming friends of ours. But most places don't have air conditioning, and if they do, it doesn't work very well. No place is overly air conditioned like almost every restaurant in the U.S. is. The grocery stores are air conditioned. Needless to say, we are well stocked in the kitchen now. Little trips to the store are one way to cool off. We don't open the apartment back up until 10 or 11 at night. One weather forecast I saw (Yahoo.com) said it would be 107 yesterday. I don't think it was quite that high. Today was supposed to be 106, according to Yahoo weather. The local paper here says it will be 38 C, which is 100 F. We'll see who is right. We have thermometers inside and out. We monitor them. Temps are supposed to go down a degree or so every day. The heat wave will be here at least until August 15. With all of our precautions in the apartment, we are able to keep it about 10 degrees cooler during the hot part of the day than it is outside. 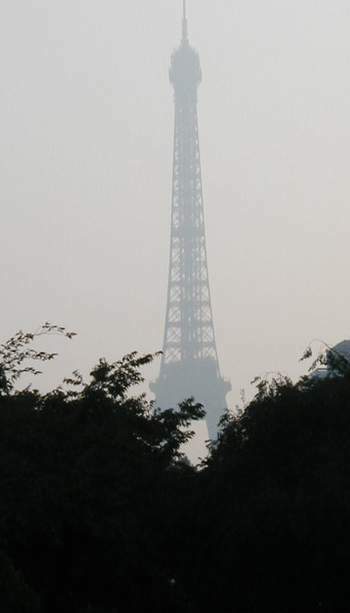 Air pollution level is "tres mauvaise," according to the local papers.